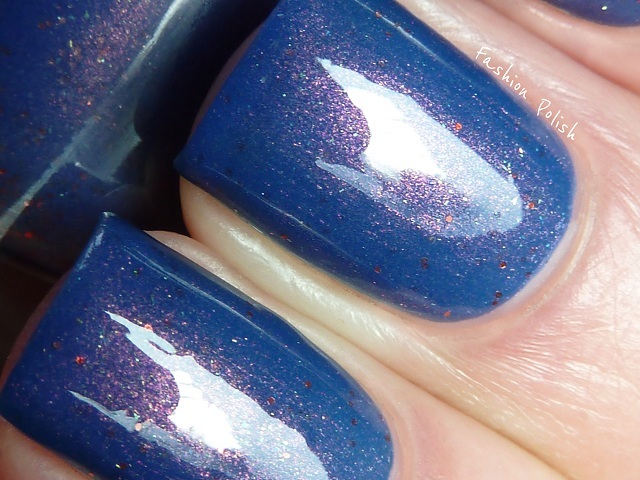 Fashion Polish: Franken Friday : Ignis Aquae! Franken Friday : Ignis Aquae! This is not the come back of the Franken Friday series, just a franken I really wanted to share with you girls... Actually I have more than just nail polish to share today! Ignis Aquae is a medium blue based polish with orange shimmer (although it appears kind of pink in the pictures) as well as orange glitter. There's also a tiny bit of small green particules but they're very sparse. To create it I used a random sheer orange shimmer in a clear base and added drops of China Glaze Riveting, China Glaze Ick a-Body and dark blue creme. I hope you liked this post and the name of this franken. I was still undecided when one of my Instagram pals suggested "Fire on Water"... And Ignis Aquae seemed just perfect! Congrats on the projects. It's the perfect outcome after having worked so hard on it. Ugh! Seriously love this polish. Beautiful! You're such an amazing frankener! 1) Congrats on work! Hopefully you can enjoy a little time for yourself now. 2) I adore this color!!! so gorgeous!! i wish i could buy it! Gorgeous shade and I love the slight glitter! Lookin' great! Love the sparkle. Oh my. Wonderful job. I love the copper color with blue. Super pretty.